On occasion I enjoy creating something that is completely non-medical in nature, and combining an exercise in traditional media with a good cause made it even more enjoyable. This carbondust portrait was a fun side project to simply get back into some traditional media and play for a bit. Inky Mouse Studios donated a gift certificate for a pet portrait to be auctioned off for a fundraiser for a non-profit group, Vested Interest in K9s, which raises money to purchase ballistic vests for law enforcement dogs. 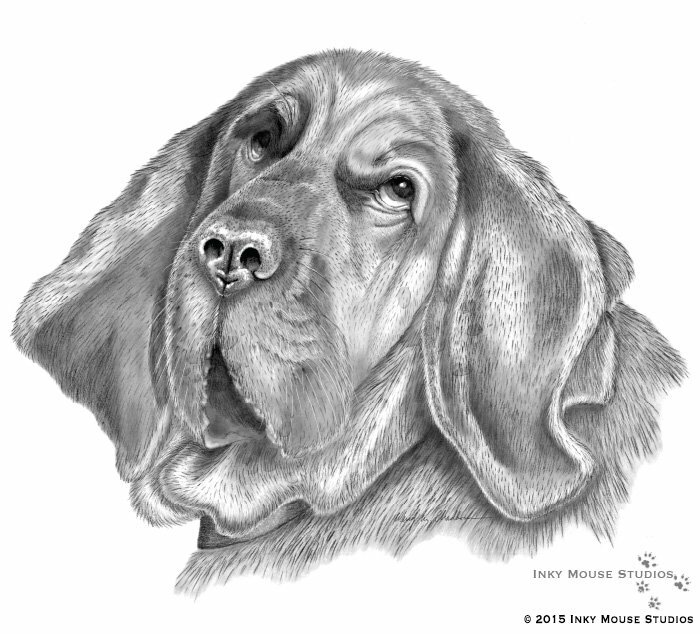 The winner was the handler of this beautiful bloodhound, and I thoroughly enjoyed creating this portrait for her. While I primarily work digitally, I truly enjoy the feel of a tool in my hand, paper under my hand, and the freedom to create something spectacular from a blank piece of paper. There is no substitute for the feeling of bringing an animal with this much character to life – from the shiny wet details of the nose to the wrinkles around the face, the velvety soft edges of those long ears and those soulful eyes.